Posted Aug. 25, 2014, at 3:30 p.m.
Last modified Aug. 26, 2014, at 1:37 p.m.
BAILEYVILLE, Maine — Construction to add tissue manufacturing operations at the Woodland Pulp mill has been delayed, but a company official said Monday the project still is expected to be completed on schedule as originally planned. When company officials announced the $120 million expansion by parent company International Grand Investment Corp. in March, they said construction would begin in the spring. The company is installing two new tissue machines that were going to be housed in an existing building that formerly contained a fine paper machine. The building was going to require renovations and a small addition. “Once we got into detailed engineering, that was going to be difficult at best,” said tissue mill manager Martin Richard. The “most feasible option” developed was to substantially enlarge the existing building in order to house the majority of the tissue manufacturing equipment, he said. “We had to extend the new building out to accommodate most of the equipment,” Richard said. The changes will not impact the cost of the project, he added, nor will it affect the project timetable or expected start-up of the tissue operations. The company still expects the first machine to be operational by the fourth quarter of 2015 and the second machine by the first quarter of 2016. The demolition of a 9,800-square-foot paper warehouse — to make way for the tissue building addition — was completed last week. Excavation work is expected to begin in September. “Our goal,” Richard said, is to have the concrete work finished in the fall so steel erecting work can progress during the winter. The building will be about 184 feet by 254 feet, Scott Beal, the company’s environmental manager, indicated earlier. The company also has received permits for two additions — one to increase storage capacity for finished products and another to house some of the ancillary equipment for the tissue operations. Planning and design work for the project is continuing. The company also is relocating an entrance gate for employees. “Traffic will flow a little bit differently,” Richard said. He participated in a meeting two weeks ago at which residents could ask questions about the project. “We were very pleased with the reception,” he said. About 30 people attended that meeting, according to Town Manager Rick Bronson. 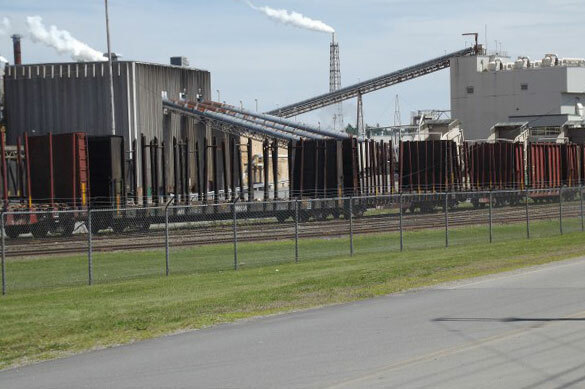 Mill officials also said at the meeting a rail line will be relocated, according to Bronson. A shipping dock will be reconfigured to handle outbound shipments of finished tissue, which will leave the plant in giant rolls wrapped in plastic. The rolls of tissue will be shipped via rail or truck, depending on destination and transportation costs. The two tissue machines will be operated by St. Croix Tissue, an affiliate of Woodland Pulp and employ about 80 people. The machines annually will produce 60,000 tons of tissue made from pulp supplied by Woodland Pulp. The sprawling pulp mill, located next to the St. Croix River on the Canadian border, employs about 320 people and is the largest employer and taxpayer in Washington County.